The Church of the Nativity was built by the Roman Emperor Constantine in 326 AD to commemorate the traditional site for the birthplace of Jesus Christ in Bethlehem. Because of its early religious significance, many scholars treat the Church of the Nativity as a very credible historic site. 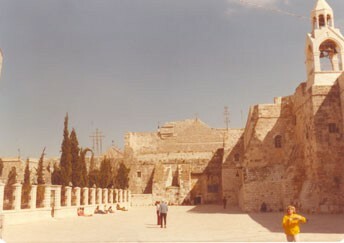 The Church of the Nativity is noted for its large cross-shaped roof and “Manger’s Square” (in the foreground below) where many Christmas worship services are held. © 2009 AllAboutGOD.com; View our Copyright Notice. 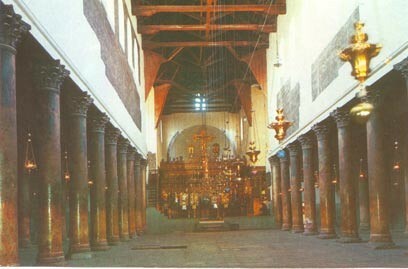 The Church of the Nativity was destroyed during the Samaritan Revolt of 529 AD. Later in the sixth century, the Roman Emperor Justinian rebuilt the church, which represents the current structure we see today. Remarkably, Justinian remained true to Constantine’s original design, reusing all but 10 of the original marble columns in the nave (see below). The hole in the floor to the left reveals the original mosaic floor from the original Constantine church. Evidence For Jesus - Go!